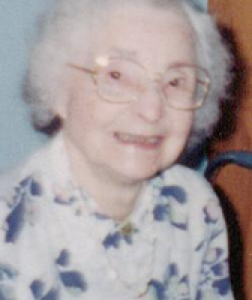 Della D. Covault, 103, formerly of 1721 Wapakoneta Ave., Sidney, Ohio died at the Brethren Retirement Community, Greenville, Ohio on Monday, October 19, 2009 at 6:00 PM. She was born January 6, 1906 in Darke County near Greenville, Ohio the daughter of William T. and Rilla (McGriff) Schlechty and they are deceased. She moved to Sidney in 1921 from Greenville, Ohio. On June 25, 1927 she married Crozier G. Covault and he died on March 22, 1983. Eleven brothers and sisters are deceased. She is survived by several nieces and nephews and special caregivers, Mrs. Donald (Imogene) Dull of Greenville, Ohio and Mrs. Donald (Jane) Kemp of Sidney, Ohio. She was a member of the North American Benefit Association. She was a member of the First Baptist Church in Sidney. She owned and operated with her husband, Crows Special Kut Signs for 60 years on Court Street in Sidney. Funeral services will be held on Thursday, October 22, 2009 at 2:00 PM at Salm-McGill and Tangeman Funeral Home with Rev. George Gnade. Burial will be at Graceland Cemetery, Sidney. Friends may call at Salm-McGill and Tangeman Funeral Home from 1:00 PM until the hour of service. Memorial contributions may be made to the National Kidney Foundation of the Miami Valley, Dayton, Ohio or the American Heart Association. Envelopes will be available at the funeral home.